Did an ape appear in your tea leaf reading? 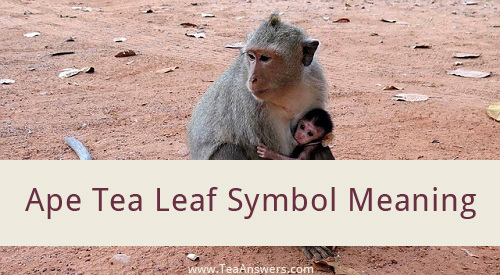 Let’s go over what the ape tea leaf symbol is telling you. Traditionally, apes were the fairies and sorcerers of myths and legends. In the myths and legends, the apes could trick the unsuspecting person into following them through the forest and into other worlds or realms. Apes have been worshiped as gods and goddesses, guardians, and protectors. Apes use their sense of touch to understand their world. Just like humans sensing through skin, especially through our fingers, apes touch the world around them in the same way. Apes use a variety of facial and body expressions to communicate with other apes. These body movements from one ape to another helps keep order in the group. Bonobos, orangutans, chimpanzees, and gorillas are the apes we have on Earth today. What’s the main difference between an ape and a monkey? An ape does not have a tail and can and does walk upright on its hind legs. Apes are herbivores, although this vegetarian diet does not keep the gorilla from being the largest ape. Some gorillas can weigh 400 pounds and stand 6 feet tall. They are intelligent, caring and kind unless under attack. Bonobos and orangutans live most of their lives high in the trees while living in close community units. If an ape has shown up in your tea leaves, it’s a thoughtful sign. It tells you to think about how you are communicating with others – too much, too little, or not at all. The ape symbol in your tea leaves tells you to look at your body language. Are you saying something different with your body than with the words you are speaking? Is there something that you want to tell someone but you are afraid to say it? The ape symbol showing up in your tea leaves tells you to openly communicate and express what you need to say. Don’t beat around the bush or the bamboo; say it now. Pay attention to those around you. Make sure you don’t have a secret enemy who might lure you into danger. What’s at the Bottom of YOUR Teacup?